Alvide is a Nord camped out in Dayspring Canyon. She came to Fort Dawnguard for protection from the vampires but the Dawnguard won't let her in. She came with her husband Barknar who also lives in the camp. Like the other refugees, Alvide will show up in Dayspring Canyon during the quest Beyond Death. With no access to the fort, she will do very little but wander around, at times chopping some firewood or use the cooking pot. She never sleeps. She wears a belted tunic and boots. 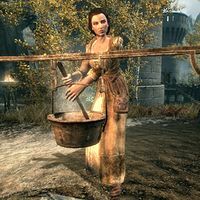 She is worried about her situation, saying, "What if the vampires come here, after the Dawnguard? We'll be stuck right in the middle." She'll tell you how she ended up camping: "Barknar insisted we come here, said we'd be safe. He also said we'd be inside the walls." However, she sees a positive side of this: "At least Barknar and I are here together." She will also indicate that she wants this to end: "I hope we can go home soon. I don't like it here." This page was last modified on 15 December 2013, at 16:59.